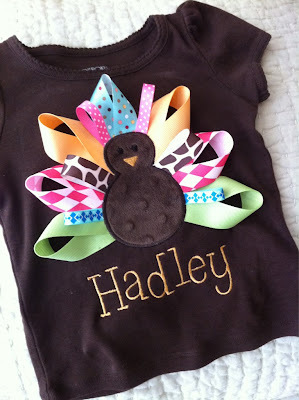 I saw this brown shirt on pinterest from Love from Texas and I wanted to make it for my little turkeys. First, I made a pattern for the turkey body by tracing around a couple of glasses. Next, I transferred the pattern to the back of the fabric and cut it out. I lightly pinned the turkey body onto the shirt. I make it easier to pin, I placed a magazine in between the layers of the shirt. Next, I pin the ribbon feathers under the edge of the turkey body. I used wider ribbons for the back feathers and thinner ones for the front ribbons. I also noticed that it looked better when I used mostly pastel ribbons. I sewed along the outside edge of the turkey with a straight stitch. You do not need to embroider the edge. I thought about stopping at this point, but I wanted to try the embroidery tool on my sewing machine. Next, I embroidered along the outside edge of the turkey. This was the first time that I used this feature on machine and I don't think that I did that bad. I can't wait to try other embroidery projects. For his beak, I made a triangle out of orange ribbon and used the hot glue gun to adhere it to the shirt. I also tacked it on with a few stitches. I used round bead buttons for the eyes. Please post links to the turkey ribbon shirts in the comments section. I would love to see them and any tips or tricks that you might have. Home Stories A to Z Hope Studios Ladybug blessings Sugar Bee Crafts My uncommon slice of suburbia Me and my boys Romance on a dime Elizabeth and Co.